Welcome to the Galaxy Tab - Galaxy Tab2 Forum. 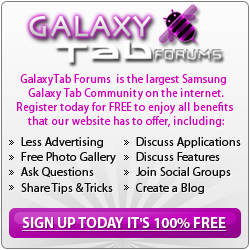 Galaxy Tab Forum site news including contests, giveaways, and more. Discuss all the current Galaxy Tab News. Found something interesting, then post it here! Samsung's Wow Factor at CES! Please read prior to posting. Need help or support for your Galaxy Tab 3? This is the place to ask. Need help or support for your Galaxy Tab 2? This is the place to ask. Discuss the various accessories available for your Samsung Galaxy Tab 2 in here. Need help or support for your Galaxy Note Pro and Tab Pro tablet? This is the place to ask. General Discussion area for all topics involving the Samsung Galaxy Note 8 android tablet that do not fit into other categories. If you need assistance with your Samsung Galaxy Note 8 android tablet this is the section to ask. Air-View has Flown the Coup! Discuss the various accessories available for your Samsung Galaxy Note 8 here. The perfect place for your Rooting needs. All technical and hacking/development discussion for the Galaxy Note 8 goes here. If you would like to make comparisons between the Samsung Galaxy Note 8 vs other tablets, please do so here. General Discussion area for all topics involving the Samsung Galaxy Note 10.1 android tablet that do not fit into other categories. If you need assistance with your Samsung Galaxy Note 10.1 android tablet this is the section to ask. Discuss the various accessories available for your Samsung Galaxy Note 10.1 here. General Discussion area for all topics involving the Samsung Galaxy Tab 10.1 android tablet that do not fit into other categories. If you need assistance with your Samsung Galaxy Tab 10.1 android tablet this is the section to ask. Discuss the various accessories available for your Samsung Galaxy Tab 10.1 in here. If you would like to make comparisons between the Samsung Galaxy Tab 10.1 vs other tablets, please do so in here. The perfect place for your Rooting needs. All technical and hacking/development discussion for the Galaxy Tab 10.1 goes in here. Galaxy Tab Audio Forum. This contains all audio discussions including music, sounds, ringtones, alerts, etc. The Galaxy Tab Video Forum. This section contains all video discussions. General Discussion area for all topics involving the Samsung Galaxy Tab 8.9 android tablet that do not fit into other categories. If you are looking for the latest development on your 8.9 Tab, check in here! If you need assistance with your Samsung Galaxy Tab 8.9 android tablet this is the section to ask. Discuss the various accessories available for your Samsung Galaxy Tab 8.9 in here. General Discussion area for all topics involving the Samsung Galaxy Tab 7" android tablet that do not fit into other categories. If you need assistance with your Samsung Galaxy Tab 7 android tablet this is the section to ask. Discuss the various accessories available for your Samsung Galaxy Tab 7 in here. General Discussion area for all topics involving the Samsung Galaxy Tab 7.7 android tablet that do not fit into other categories. If you would like to discuss something not related to the Galaxy Tab/Android, please do so in here. Most users ever online was 1,724, 05-28-2016 at 05:49 PM.